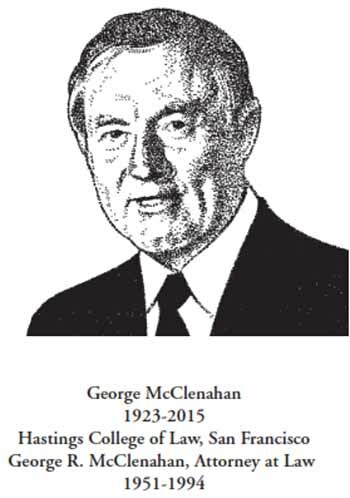 George McClenahan- was born and reared in Indiana, attending schools in Decatur, Indiana and graduated from University of Indiana in 1947. He served honorably in the United States Navy as a TBM (Avenger) pilot on the USS Antietam from 1943 to 1946, in both the Atlantic and Pacific war zones, but never encountered combat duty. In 1947 McClenahan went to San Francisco where he attended Hastings College of Law, graduating in June, 1951, and was admitted to the California Bar. His first employment was Deputy District Attorney in Madera, California, where he tried multiple cases from misdemeanors to capital murders, and established a reputation for himself as a vigorous and honorable prosecutor. That conduct never changed, regardless of which side he represented, in his distinguished career. Following an inspired move to San Diego in 1952, Mr. McClenahan was employed by the District Attorney's office and subsequently entered private practice in 1954. He subsequently became a partner of David S. Casey and engaged in a congenial and successful relationship with him for many years. That firm eventually became Casey and Gerry, after Mr. McClenahan left the firm in 1975 and set up an extremely happy sole practice in quaint offices at Seaport Village. He relished calling himself the "lawyer whose offices were back of the Fudge House and above the popcorn stand". One of his fond reminiscences was when dueling attorneys were engaged in unpleasant depositions in his office. Mr. McClenahan finally declared a Time Out, took the participants for a pleasant walk around the lovely park at Seaport Village, ending up at the ice cream store, where he treated everyone to cones and then returned to a productive finish to the depositions. Although Mr. McClenahan tried many successful plaintiff's personal injury cases, his most public one was that of defending the late Mayor, Frank Curran, from charges of bribery and conspiracy. Although the evidence was slim, at best, he chuckled that what turned the case around was an exchange in the courtroom between himself and the prosecutor, who had repeatedly called him "Clyde" when objecting to evidence. The judge had asked at one point whether the evidence was Exhibit C or Exhibit G, to which McClenahan replied, “That is G for George, your honor, NOT C for Clyde." The courtroom erupted in laughter and the jury quickly returned a Not Guilty verdict. George married the former Sally Judd in January, 1948, and remained happily married until his death ... the proud father of Michael (Celeste), Janet, Patrick (Kathleen), and Kam (Ted Barker)... As well as 7 grandchildren and five great-grandchildren. They reared their family in La Jolla, retired to Mission Beach in 1994, and spent the final three years of his life contentedly at Wesley Palms Retirement Community. An avid small boat sailor throughout the 1960's and 70's, he was a lifetime member of Mission Bay Yacht Club and ‘maintained lifetime friendships from there. Professionally, he was President of Western Trial Lawyers, American Board of Trial Attorneys, San Diego Trial Attorneys, and was proudest of having become a member of the American Board of Trial Attorneys. Probably the outstanding characteristic of Mr. McClenahan was his unfailing adherence to Bar ethics and his constant ability to keep a light touch and superb sense of humor in all his behavior, both in and out of the courtroom.